Freeze brings Luciano & Friends to Liverpool, UK for a rare one off gig at St George’s Hall on Saturday June 22. 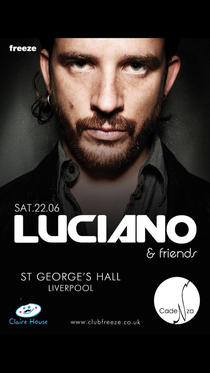 From the Cadenza crew, Luciano is joined by Reboot, Andrea Olivia and Argy, with more acts yet to be announced. St George’s Hall is one of Liverpool’s most iconic buildings, a majestic and draw-dropping beautiful setting. Freeze is becoming known for identifying original and creative venues, having been the first promoters to put on an electronic music event in a practicing cathedral, and 2013 finds them with plans to take over even more unusual spots. While the show endeavours to bring some of the best artists and quality music to Liverpool this June, the real reason behind this event is to raise awareness of the Claire House Children’s Hospice. The show hopes to raise money and spread the word about the amazing work taking place at the hospice. For full info, check: www.clubfreeze.co.uk.